De Roode Zee met de Kusten van Arabien; en het Naauw tussen Aden en Zeila tot aan Bassora. 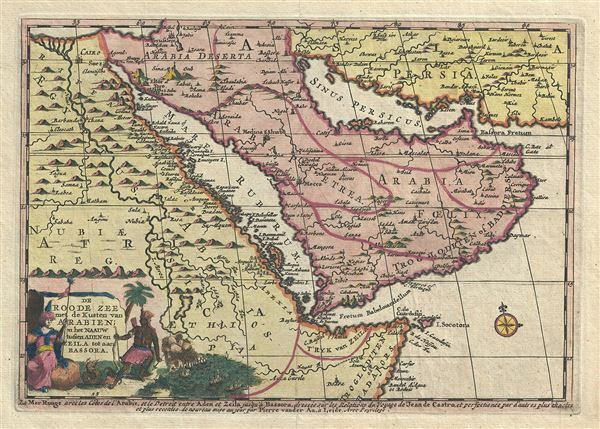 This is a very attractive 1707 map of Arabia and Egypt by the Dutch cartographer Pieter Van der Aa. Pieter's (or Pierre) map covers from the Nile delta east as far as the Gulf of Oman and south to include much of modern day Somalia. The map is based on a sinusoidal projection, which makes Arabia look slightly distorted. This highly detailed map follows the travels of Jean de Castro, noting several cities, islands and other topographical features, with mountains beautifully rendered in profile. Mount Sinai is identified. The cities of Cairo, Mecca, Medina, etc. are also noted. Although the coastlines of the region were explored at the time, much of the interiors remain unexplored and therefore speculative. This map was originally issued in Vander Aa's Naaukeurige versameling der gedenk-waardigste Zee en land-reysen an Oost en West-Indien, this particular map was reprinted in the Atlas Nouveau. Created by Pieter Van der Aa in 1707. Very good. Minor wear along original centerfold. Minor toning and spotting. Original platemark visible. Tibbetts, G. R., Arabia in Early Maps, 192.